The statistic shows the gross domestic product (GDP) per capita in the United States from 2012 to 2017, with projections up until 2022. In 2017, the gross domestic product per capita in the United States amounted to around 59,792.01 U.S. dollars. Thus, the United States is one of the countries with the largest GDP per capita worldwide. See the U.S. GDP growth rate here and the US GDP for further information. For comparison, per capita GDP in China had reached about 5,523 U.S. dollars in 2011. The gross domestic product (GDP) of a country is an economic key figure, as it represents the market value of goods and services produced in a country within one year. The United States’ GDP) is increasing consistently, and it is expected to continue growing. On a global scale, the U.S. share of GDP adjusted for Purchasing Power Parity has been in the range of 20 percent over the last few years, give or take a few percentage points. The United States has the largest GDP worldwide, with a significant lead over China, Japan and Germany. 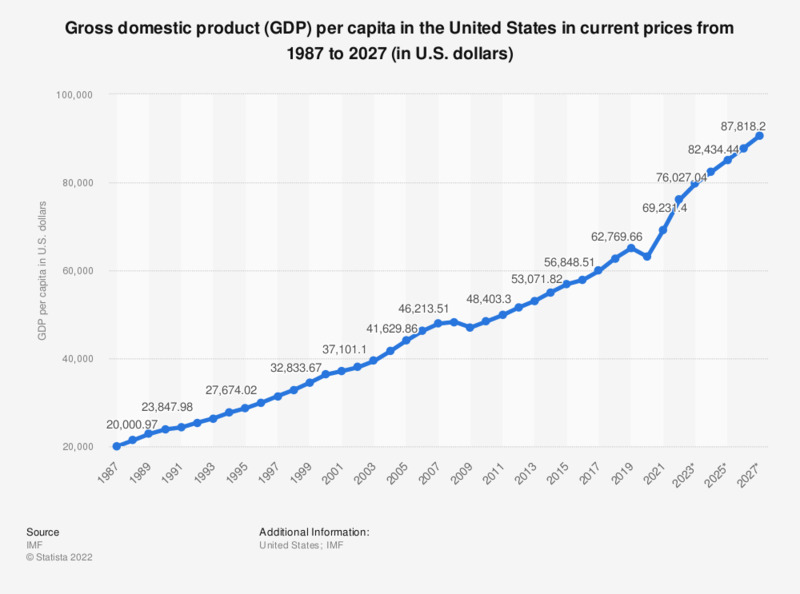 Gross domestic product per capita is annual GDP divided by the average population from the same year, which allows for a GDP calculation per inhabitant of a country. Thus, a country with a high GDP, like the United States, can still have a low GDP per capita. Consequently, if compared to other countries, the United States does not rank among the top ten on this list . Figures have been rounded for the sake of a better understanding of the statistic.